Oh wow the real deal! Hope he enjoyed the experience. He did thank you, said he wants to go again! Yep first time, he said it was great! It was his first visit to a ‘big game’! Ooooh exciting. Who did you see play? Notts County vs Portsmouth! Great seats for a first visit! aww hope he enjoyed it. Looks like he is having fun! He says it was great and he wants to go again! Perfect view for any goals. He saw all three goals, very pleased!! Yep, he did thank you! Bless. I hope he had a great time. He does look a bit disappointed with the hot dog, obviously not as good as mums, hope he enjoyed the football. He said the sausage was too crunchy but the bread was delicious! He said he wants to go again, so think he enjoyed it! 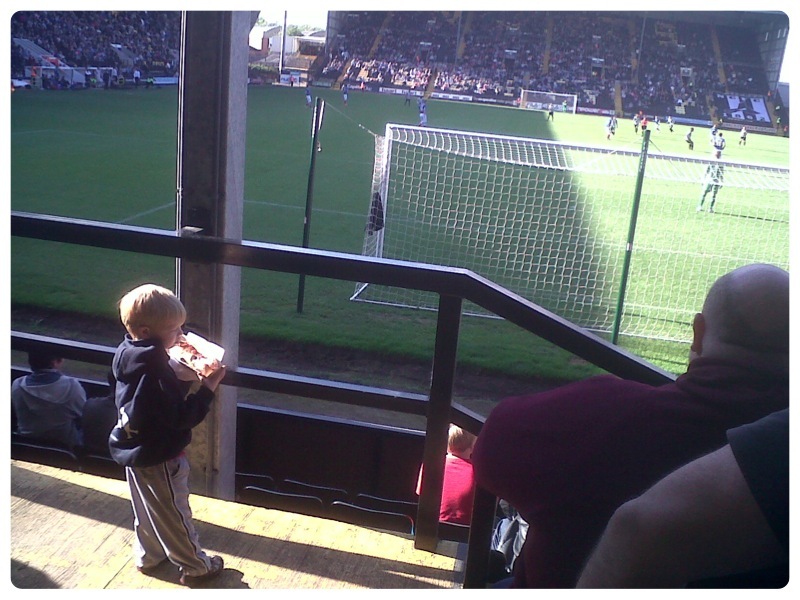 Notts County and Portsmouth – Got a couple of tickets from school – education hey! Apparently the sausage was a bit too crunchy (?!) but the bread was delicious – lol!